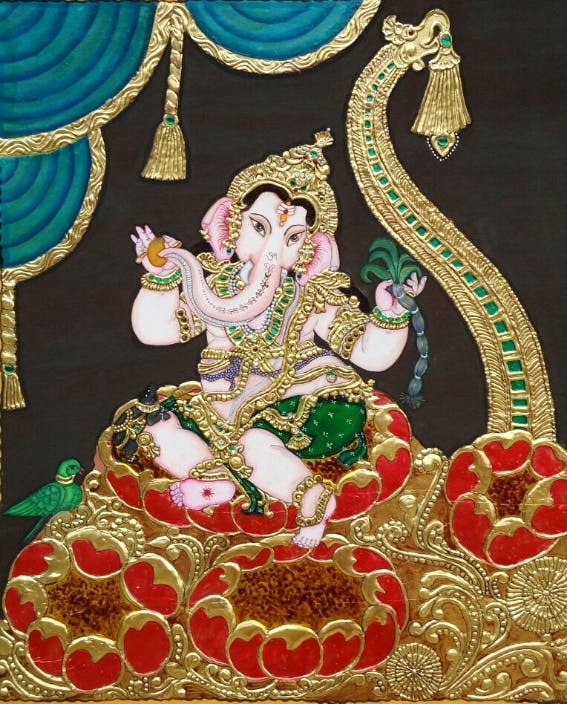 The classic south Indian painting that originated around Tamil Nadu and Karnataka is taught here. The teaching method of these style of paintings is beautifully taught in a systemic way from basics to the completion. I loved the way the painting was showcased. The artist was very friendly too. The painting was taught using a traditional approach which makes it unique. It good to know about the traditionally ways how the paintings were made in earlier times. I enjoyed my class thoroughly. The place is located in Banashankari 3rd stage. Classes are conducted in their residence, with Tanjoor and Mysore art forms they also conduct oil painting, acrylic painting and drawing classes for kids. Prices start from INR 7000 for the size of 12"x12" and the prices vary according to sizes choose, sizes are customized too according to the customer preference and the painting is custom made for each individual.